How do I get two status-bar clocks with different timezones? but they all use the system time (which I'd like to keep as-is). Are there any applications that allow timezone-munging inside the app, or will I need to write this myself? Note: Loversclock, mentioned in another post, didn't download. I would also really like to display multiple times in my menu bar, but I'm not able to find anything like that either. I landed on Clocker. It's free and you can easily assign a keyboard shortcut which is really nice. Would having a menubar clock that displays other timezones in a drop-down menu work? 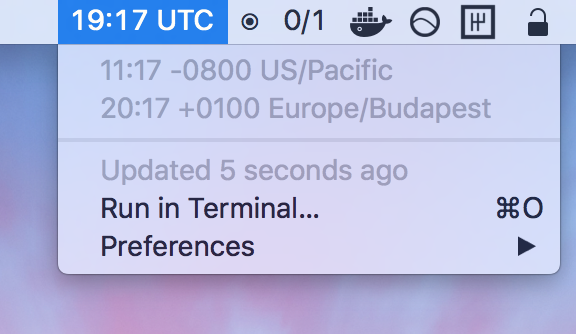 I find iStat Menus works for me for seeing other timezones easily, albeit not as easily as having the time in the timezone you want shown right there. It's commercial software, but there are similar open source project out there. Maybe one of them does the "other timezones in the dropdown" thing? Not the answer you're looking for? Browse other questions tagged macos timezone clock . How to access web dev servers running on localhost with non-standard ports from the network? Is it possible to programmatically monitor the recently changed files on my OSX system?